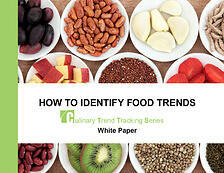 A white paper detailing how researchers within food organizations can identify and analyze food trends to create business opportunities. When you work in the fast-paced, ever-changing world of foodservice and food retailing, keeping abreast of the most current industry trends can be a real challenge. And, in order to set yourself apart from your competitors, you must go beyond the traditional trend-spotting paradigm and vet trends to uncover new opportunities.